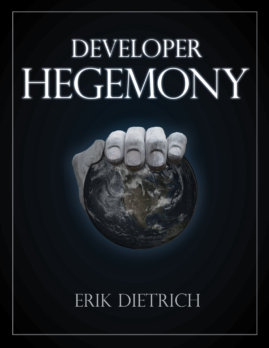 Today, I offer post number 7 for Developer Hegemony week. I had every intention of doing 9 days of posts in a row leading up to launch, but I wound up spending yesterday relaxing and recuperating (not a lot of Sunday traffic anyway). I just finished up an engagement and had been on the road for weeks straight, finally getting home Friday night. So I took a day off. The good news is that even with me taking it easy yesterday, the internet did not. The Thunderclap campaign reached its goal! This means that I will now definitely give away 3 free copies of my book. So signing up now gives you better odds than ever. A post about rethinking retirement might seem odd, but I have a method to this madness. As you contemplate your working career, retirement may not come immediately to mind. But it certainly looms large over decisions you make during your career, in much the same way that the college admissions process tends to loom large over high school. You contribute to 401Ks, look at the compound effect of salary negotiations and the like, all with an eye toward retirement. So let’s dive into the mechanics of normal wage work and retirement a bit today. But first, I’ll lead in with a quick rationale for what brought this to mind. Because I have some varied business interests, I tend to get politely restrained questions from people with salaried jobs as an exclusive source of income. People regard direct questions about income quantity as gauche, so they kind of ask how things work in the abstract. They beat around the bush a bit. Okay, so back to retirement. I’ll start with an oversimplified version of how that works. Specifically, let’s forget for the moment about any concept of social security, pensions, or investing in markets. A wage earner spends most of his adult life collecting a paycheck. He uses some percentage of that paycheck and sets some percentage aside, stuffing it into his mattress. He continues to do this until he has more stuffed into his mattress than he’ll need before he dies. At this point, he retires. For the sake of easy math, let’s assume that this hypothetical person averages $100K per year as a salary throughout his career. Let’s say that he decides he can live on $50K per year in retirement and that he saves 10% of his salary throughout his life. If he starts working at 20 and retires at 70, he will have set aside a total of $500K. This will allow him to live from 70 to 80 before he runs out of money. So in a strange case of somewhat perverse incentives, he should hope not to live longer than 80 (or he should continue working). Of course, people don’t stuff their retirement savings under the mattress. They don’t do this for all manner of reasons, not least of which is how bleak that would make the retirement picture. We save for retirement by putting our money into investment vehicles and letting it appreciate. This, combined with social security, lets our hypothetical wage earner do a whole lot better with his 10% retirement savings per year. So let’s look a little harder at what actually happens with those investments that bear fruit. And, let’s assume, for argument sake, that the wage earner can earn a 5% per year return on his investment. After 10 years, the wage earner has squirreled away at total of $100K. Stuffing it under the mattress, this provides him with enough cash for 2 years of living expenses. But, put into the market, it provides him with a business property through which he can earn $5K per year. So, in a way, you can think of the $100K saved not as cash, but as the buy-in for a business that generates passively generates $5K. Remember his goal of $50K per year for retirement? Well, he’s now locked down a tenth of that. If he can create 9 other, similar business properties, he can retire and live indefinitely. Oh, and if you want to understand what makes compound interest so powerful? Consider that after 20 years, when he’s squirreled away $200K, his business property is now matching his annual savings in terms of money generated. When you think about this guy’s $200K worth of business properties, do you think to ask yourself about the hourly rate he earns on the $10K per year? In a strained sense, you could say that he worked for 20 years (or 41,600 hours) to earn that, so when he earns $10,000 in the first year, he earns about 25 cents per hour. Of course, maybe you increase that to $2.50, reasoning that the 10% savings represents only 10% of his actual hours worked. But then, in either case, after 2 years, he’d have earned $20K so you’d need to double both of those figures. Then you’d double them again after 4 years. But, still, you’re talking about $1 or $10 per hour for a guy that makes $50 per hour working. So, does this become wise after he’s earned on it for 20 years? Or, does this line of thinking make no sense as I alluded to earlier? It might be that owning business properties doesn’t actually resemble hourly labor in any meaningful way. When I write books or make Pluralsight courses, this same reasoning applies. I spend some (frankly untracked) amount of time building business properties that will later earn me money with little work for an indefinite period of time. Let’s say that I did enough books and courses to earn $10,000 per year indefinitely. What I’ve done is create the equivalent of a business property valued at $100,000, if we compare apples to apples. If this line of thinking makes you scratch your head a bit, I understand. It took me a long time before I got away from reasoning about money in a way that eternally divided it by units of time to create wage, a seductive unit of earning velocity. But the rate at which you earn money doesn’t actually matter directly to your financial independence. The business properties you own matter. We tend to tabulate rates automatically to understand relative worth. For example, let’s say that a second hypothetical person makes $100K per year, and that she does so in a salaried position (no overtime). This means that, regardless of the number of hours worked, she earns $100K per year. She’ll tend to use the math of 40 hour weeks though and count her time at a worth of $50 per hour. 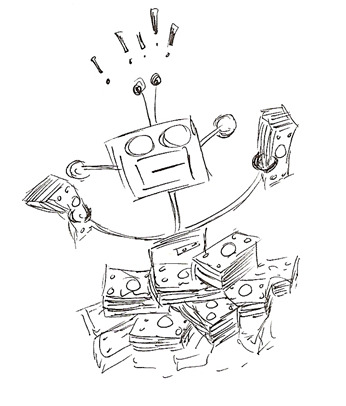 Efficiencers and efficiencer firms, I think, will increasingly view their earning situations more as business properties and less as sources of wage. And this involves a mindset shift. A while ago, I talked about missionary and mercenary opportunism and how efficiencers take the mercenary approach. They look for financial independence (retirement at any age). The life of an efficiencer will involve speculatively looking at how to generate and retain ownership stake in business properties. These could include things like books, courses, apps, info products, and any other number of things. Even as sellers of services or productized services, businesses acquire value and earning power through things like their brand and their book of business. Of course I’ve glossed over an important consideration for ease of explanation. Writing a book (or doing any of these other things) does not guarantee you $10,000 per year of income, like clockwork, forever. But then, neither does playing the market. In both cases, you do need to have some vigilance and continued offer of value. I didn’t set out today with the goal of fundamentally altering your life or anything like that. But I do hope that you’ll start to contemplate income and assets differently. In Developer Hegemony, I talk about owners and faux owners. If you want to secure financial independence — retirement — at any age, you need to start thinking like an owner.